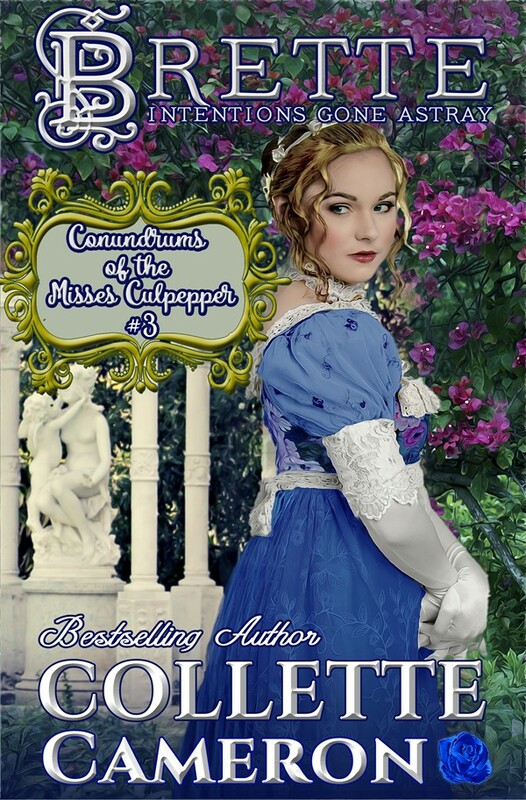 I am a fairly new reader to Collette's Books and this is the third book in the "Conundrums of the Misses Culpepper". I really enjoyed this story. Collette knows how to add surprise after surprise to keep you enthralled to the very end. Brette is a young lady who fancies herself as a cupid, helping other ladies land the gentleman of their dreams. Alex is handsome, witty gentleman who makes his living as a Rector. Though he knows he is really not cut out for the Church, he has to eat and when you are Quality there are only so many ways to make a living and still be accepted in Society. He wants Brette desperately, but knows that she can do so much better than a poor Rector. Then fate intervenes and both Brette and Alex have life changing events. Will they get their HAE. Collette tests the fortitude of her characters by putting them into situations that will test their love for each other. Her writing is witty, sharp, smart and delightful to read. You can read this book as a stand alone as I did. If you have read the first two then you are in for a little surprise. Either way this is a must read. I love Collette's Culpeppers! And the twist in this one - OH MY!! !